This black fabric and leather purse is an Americana by Sharif. The exterior has a high-low horizontal fabric divided by four elevated stitched horizontal areas. 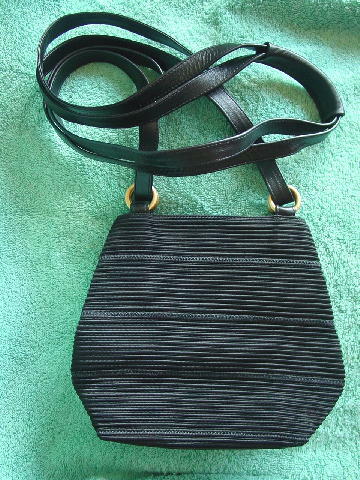 The black bottom, the straps holding the gold-tone rings, the interior, and the strap shoulder holder are black leather. The two 42 1/2" by 5/8" black shoulder straps are faux leather. The interior has two sections, both with a thick black grosgrain lining. 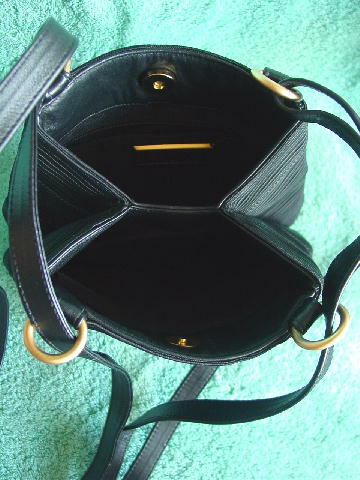 One section has a lined large zipper pocket with a gold-tone metal logo tag. There is an interior upper magnetic closure. She sold it because she needed the money.